1 Jack Rowe, native of Westward Ho! 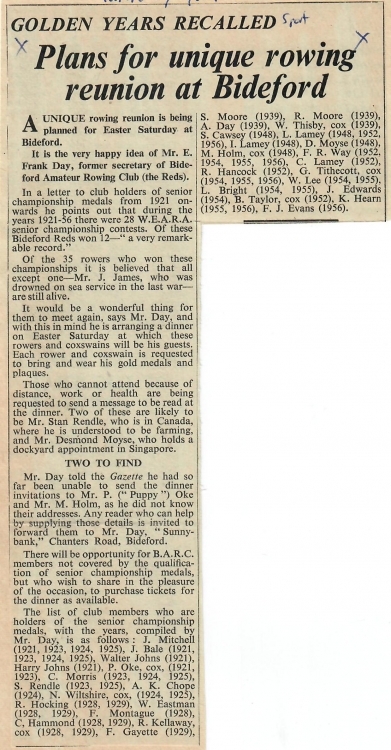 3 Mr Jack Rowe of Westard Ho! 17 Memento Picture of Golf Championship at Westward Ho! 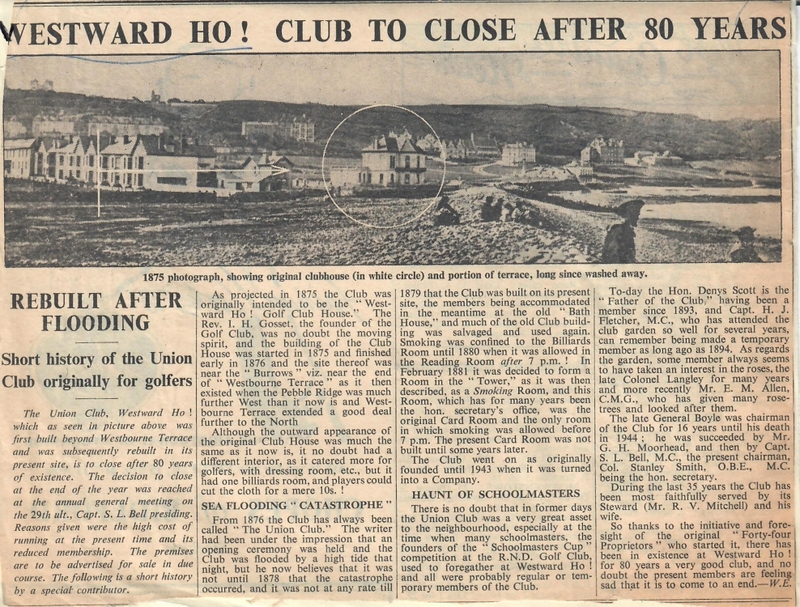 22 100 Years of Women's Golf at Westward Ho! 29 In the history books? 39 Stars of the future? Jack Rowe, native of Westward Ho! 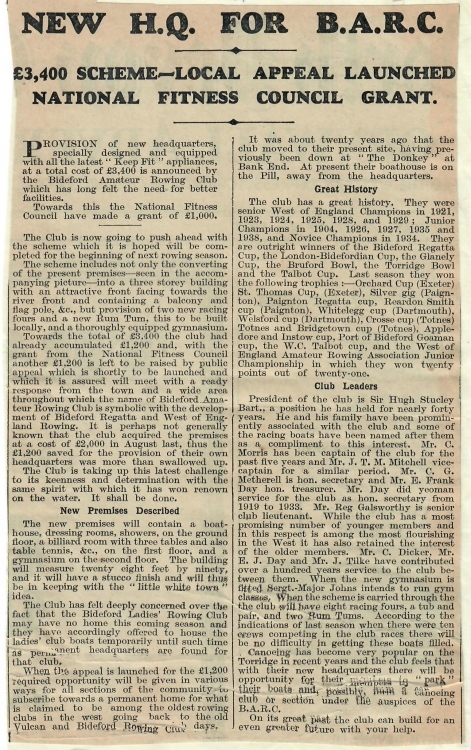 As a token of their appreciation of his fifty years’ service as professional to the Royal Ashdown Forest Golf Club, the members of the club have presented to Mr Arthur John (Jack) Rowe a handsomely framed illuminated address and an envelope containing War Savings Certificates. Mr Jack Rowe of Westard Ho! 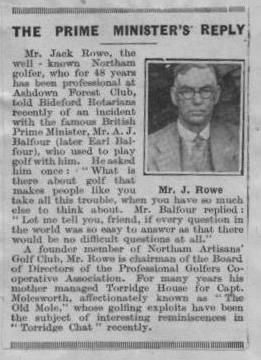 Mr Jack Rowe, the well known Northam golfer, who for 48 years has been professional at Ashdown Forest Club, told Bideford Rotarians recently of an incident with the famous British Prime Minsiter, Mr A J Balfour (later Earl Balfour), who used to play golf with him. It was a 'civic surprise' night at Bideford Conservative Club on Monday when the only second division team left in Bideford Snooker League's knock-out cup competition, Town Hall, beat the Newsboys by 3 games to 2, to go into the hat for the semi-final draw. 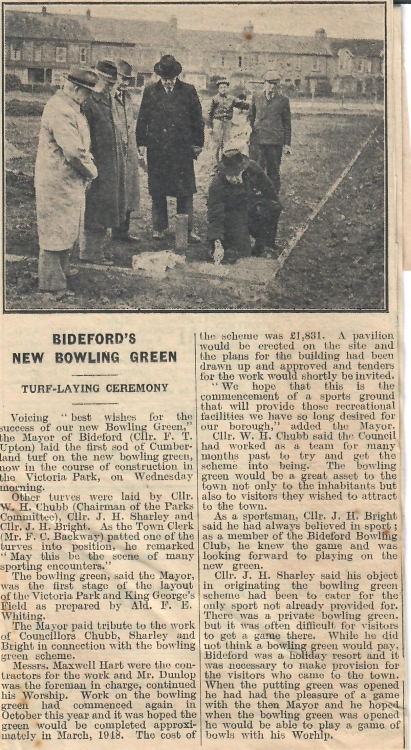 Town Hall team comprises members of Bideford Corporation staff, while the Newsboys are now back again writing headlines instead of trying to make them! 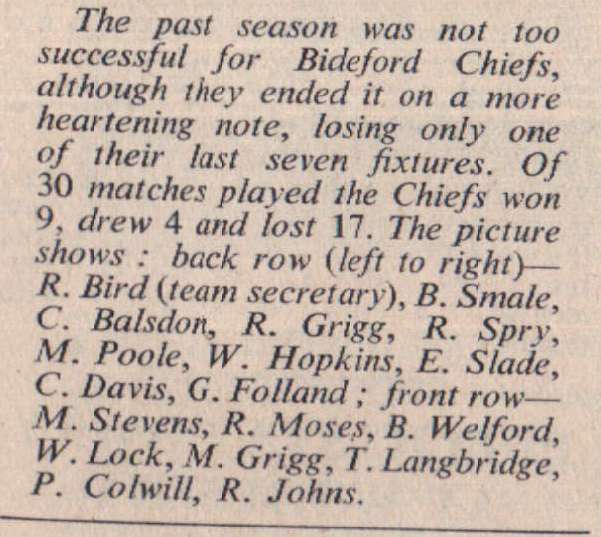 Bideford Chiefs haven't had a successful season. In the picture are R Bird, B Smale, C Balsdon, R Grigg, R Spry, M Poole, W Hopkins, E Slade, C Davis, G Folland, M Stevens, R Moses, B Welford, W Lock, M Grigg, T Langbridge, P Colwill, R Johns. 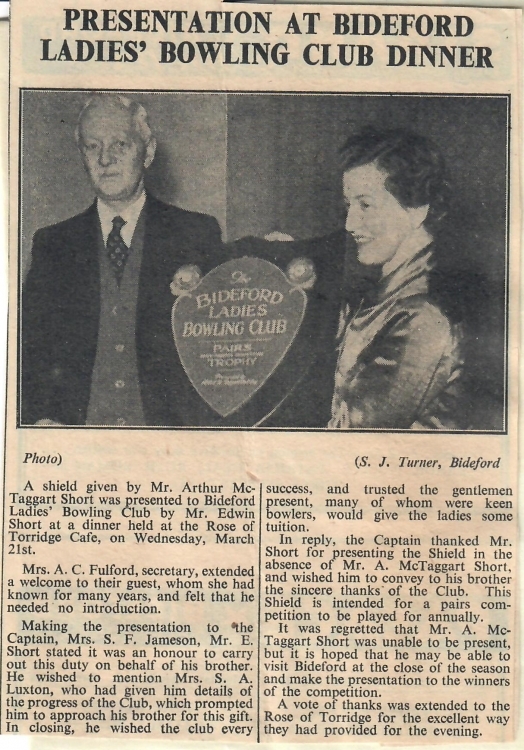 Mrs Margaret Fulford, of Orchard Hill House, Bideford, wife of Mr Norman Fulford, has been elected Devon women's captain for 1971. She is the first member of the Royal North Devon Golf Club since the war to be appointed to this position. 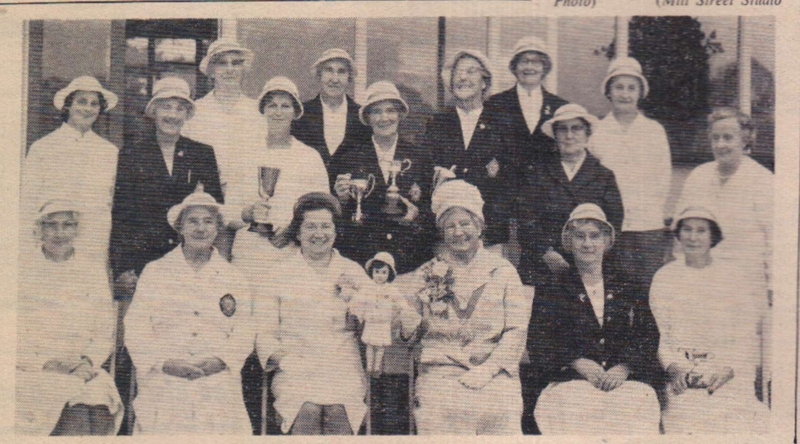 She plays off a 16 handicap and with her R.N.d clubmate Mrs Peggy Fourt, this year reached the final of the county foursomes. An inscribed tankard, in recognition of his notable scoring last season when he created a new individual record of 252 points – over a hundred more than the previous best – has been presented by Bideford Rugby Football Club to Chief’s full back Mike Grigg. 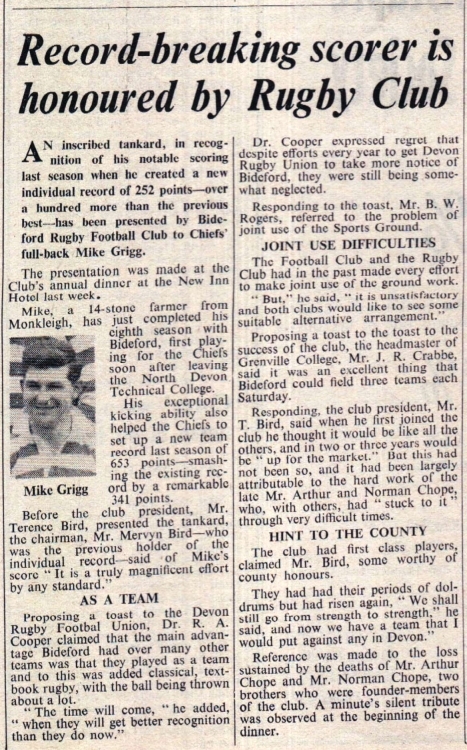 Mike, a 14 stone farmer from Monkleigh, has just completed his eighth season with Bideford, first playing for the Chiefs soon after leaving the North Devon Technical College. Memento Picture of Golf Championship at Westward Ho! 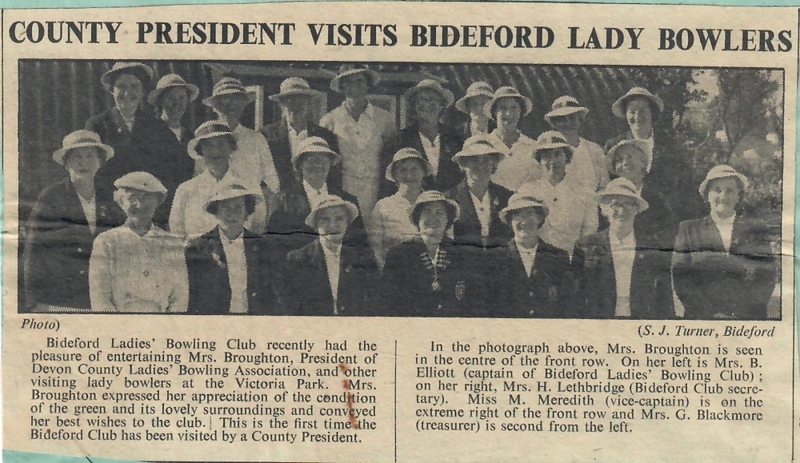 Members of Victoria Park and Ladies’ Bowling Club and the Mayor and Mayoress of Bideford after the Mayor (Mrs E J Brown) had presented the season’s cups and prizes at the Club on Thursday week. 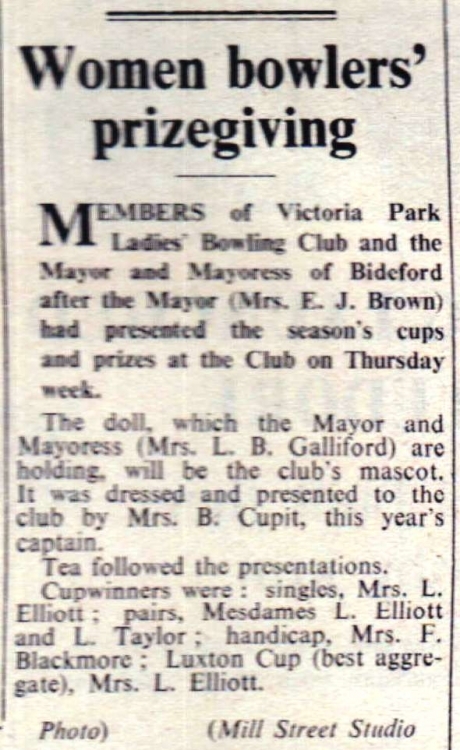 The doll, which the Mayor and Mayoress (Mrs L B Galliford) are holding, will be the club’s mascot. It was dressed and presented to the club by Mrs B Cupit, this year’s captain. Cupwinners were: Mrs L Elliott, Mesdames L Elliott and L Taylore, Mrs F Blackmore. 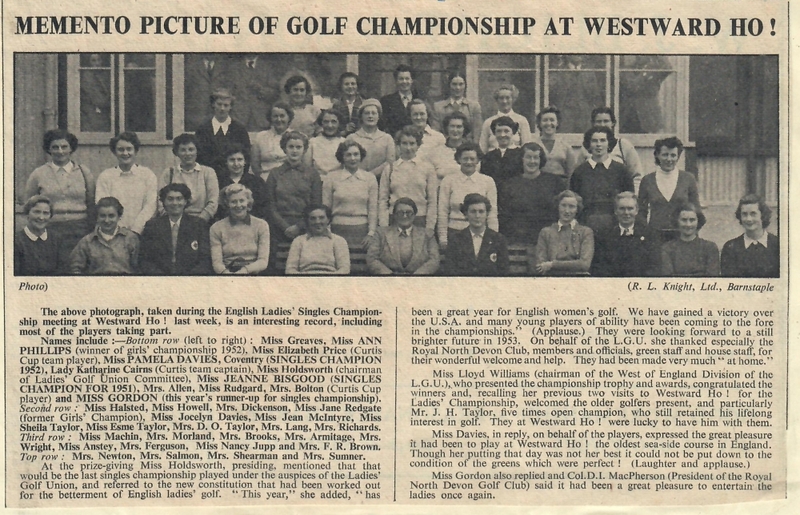 100 Years of Women's Golf at Westward Ho! 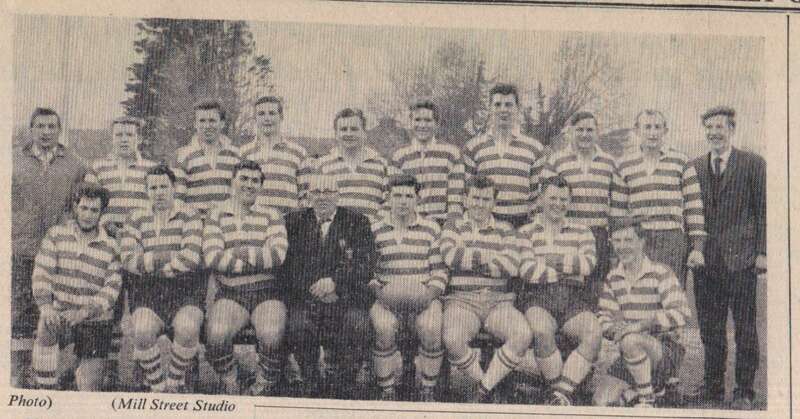 In conditions which suggested forward play, the handling of the Bideford team turned out surprisingly good and, in fact, the tries came from handling movements and not from forward rushes as might have been expected. The clean, consistent hooking of G Woolf gave the Chiefs an initial advantage of which the backs made good use. C Davis, wing three-quarter played a fine game and scored two of the tries; the first coming from an orthodox three-quarter movement and ending when he threw off three defenders and touched down in the corner. Bideford was represented by three crews in the women's fours at the regatta on Saturday. 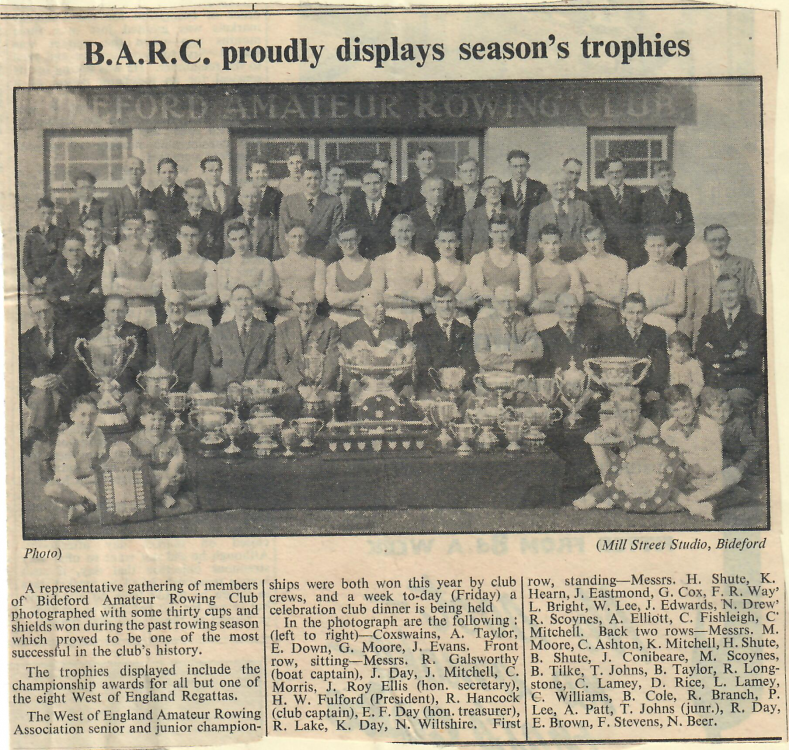 All of the rowers in two of the crews - A and B - were aged 16 or under. 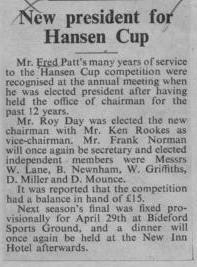 Mr Fred Patt's many years of service to the Hansen Cup competition were recognised at the annual meeting when he was elected president after having held the office of chairman for the past 12 years. Mr Roy Day was elected the new chairman with Mr Ken Rookes as vice-chairman. 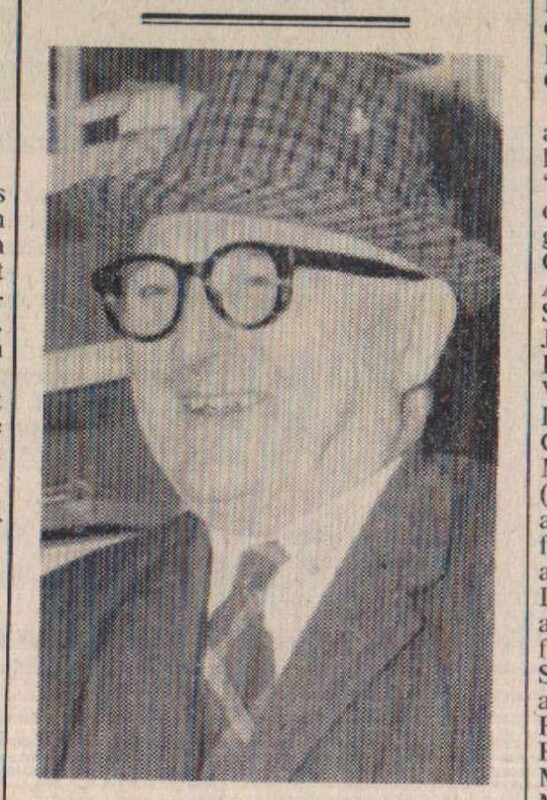 Mr Frank Norman will once again be secretary and elected independent members were Messrs W Lane, B Newnham, W Griffiths, D Miller and D Mounce.It was reported that the competition had a balance in hand of £15. With a goal in the dying seconds Bideford County Secondary School senior netball team managed to make it an 8-8 draw when, at Torrington County Secondary School, they met Torrington seniors. 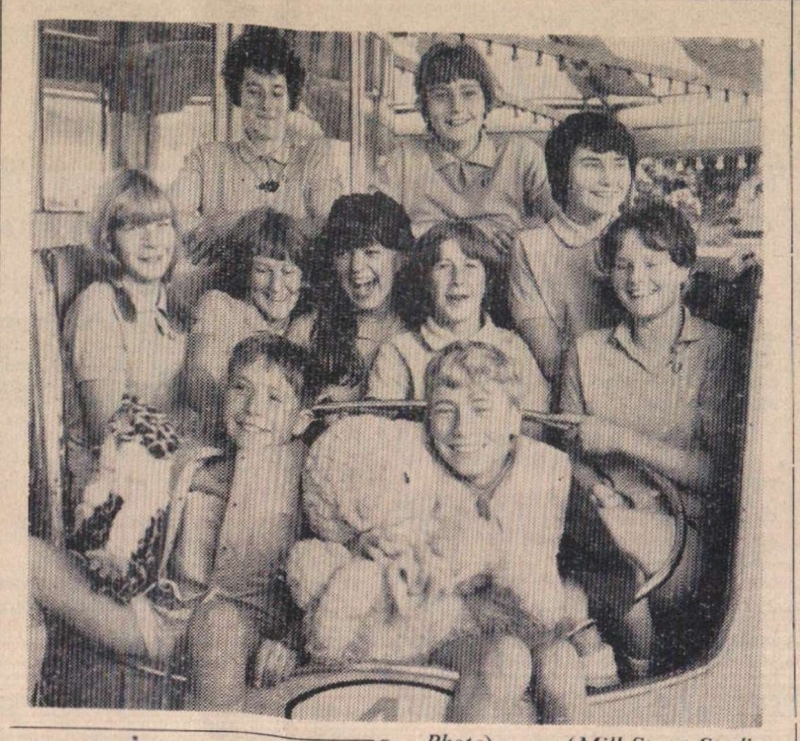 Bideford – Susan Hillman, Wendy Harris, Pat Rogers, Sandra Miles, Maureen Tithecott, Susan Slade, Sally Holliman. 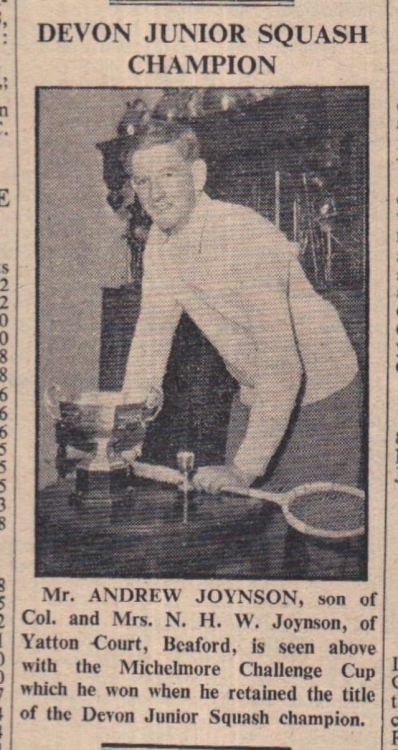 Mr Andrew Joynson, son of Col and Mrs N H W Joynson, of Yatton Court, Beaford, is seen above with the Michelmore Challenge Cup which he won when he retained the title of the Devon Junior Squash Champion. Some of the local girl footballers who tonight are competing for the title of North Devon Soccer Personality Girl. With the title goes a prize valued at £10. The occasion is the first annual dinner of the Legs Eleven ladies FC of Appledore, at the Westward Ho! Holiday Centre. An attendance of 450 is expected. 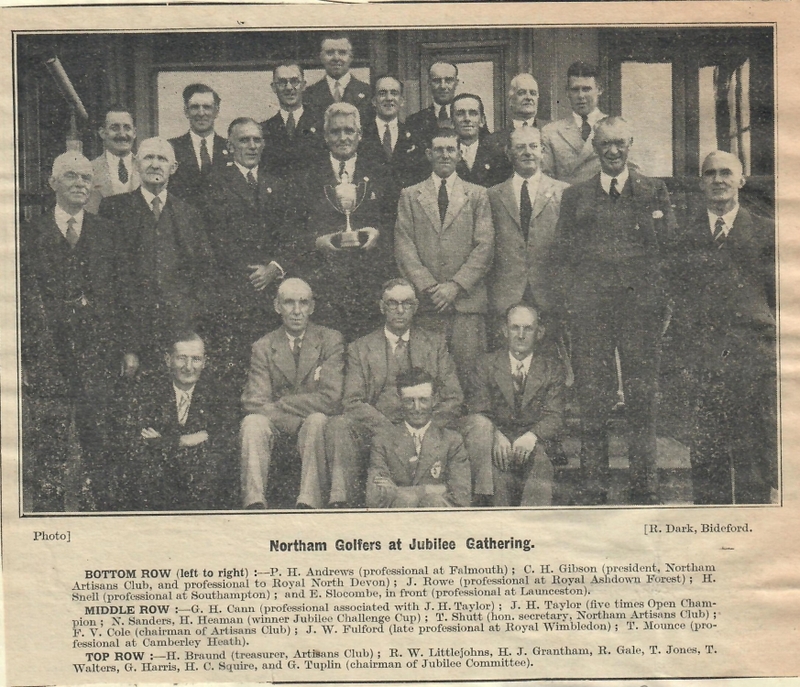 In the golfing world, Northam has gained its own small niche in the game’s history books as the home of John Henry Taylor, one of the Great Triumvirate who was British Open champion no less than five times. One of three Bideford boxers who made the journey to Kingsbridge on Saturday, light-middleweight Graham Fishleigh, won his tenth bout in succession. He twice sent his opponent J Flower to the canvas for counts of nine before the referee stopped the content in the third round. Six of Fishleigh’s verdicts have been secured inside the distance and he remains unbeaten. Played five, won five, is the notable record of Langtree County Primary School Netball team for the Easter term. Winners of Bideford Snooker League’s knock-out cup competition are Bideford Conservative Club. 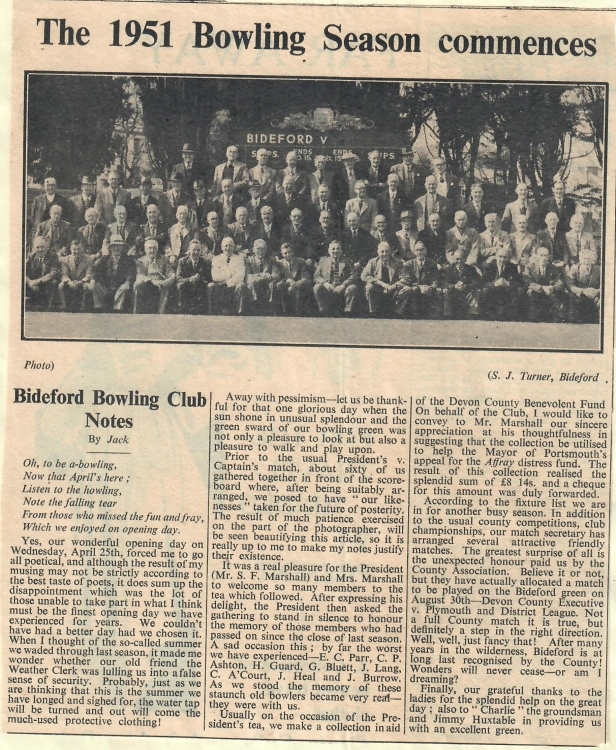 In the final at Bideford and District Club they defeated the District Club team by 3-2, although the issue had, in fact, been decided when the Conservative Club won the first three frames. 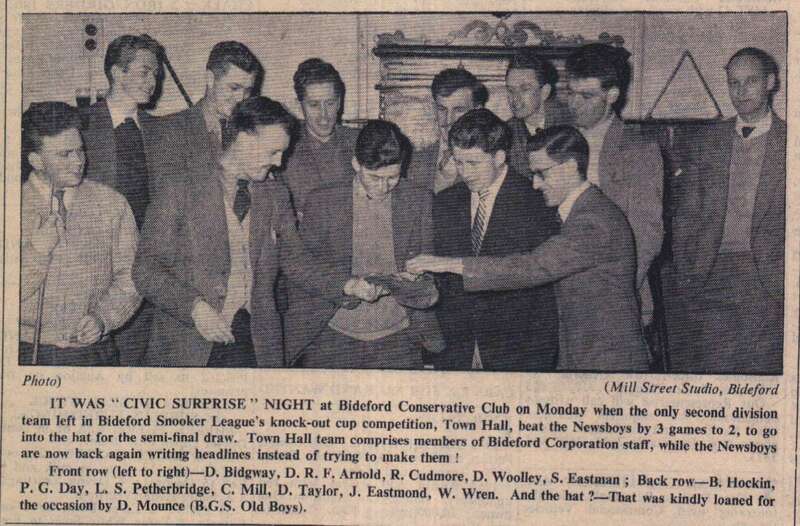 Norman Gale and Albert Hedden staged an exciting finish, Gale winning after the black had been re-spotted, and thus starting the Conservative Club on their winning margin. Details: N Gale; A Hedden; W Headon; S Fishleigh; S Shute; K Seymour; G Jones; I Whitaker; F Dee; A Mills. 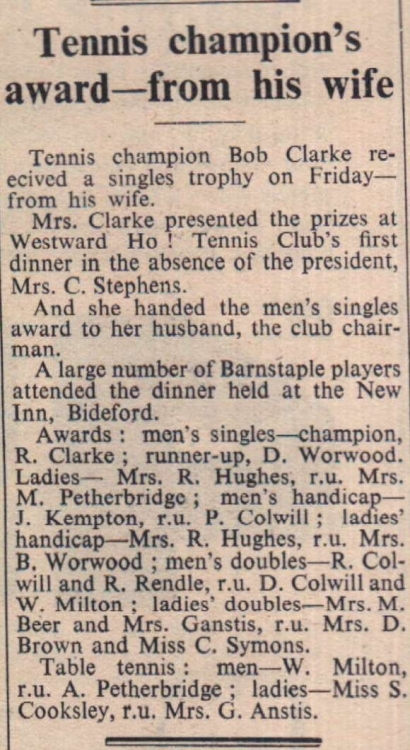 Tennis champion Bob Clarke received a singles trophy on Friday – from his wife. Mrs Clarke presented the prizes at Westward Ho! Tennis Club’s first dinner in the absence of the president Mrs C Stephens. Awards: R Clarke; D Worwood; Mrs R Hughes; Mrs M Petherbridge; P Colwill; Mrs B Worwood; R Colwill and R Rendle; D Colwill and W Milton; Mrs M Beer and Mrs Ganstis; Mrs D Brown and Miss C Symons. Table tennis: W Milton, A Petherbridge; Miss S Cooksley, Mrs G Anstis. Ex-Navy man Mr Les Mott, superintendent of Bideford Parks, stands ready to run up the Western League championship flag presented to Bideford Football Club during their mid-week meeting with Bristol City last week. Watching the ceremony on the far left is Mr Ernie Hopkins, the club chairman, Mr Les Phillips, Bideford's representative on the Western League, and Mr George Templeman, donor of the flag and vice-chairman of the league. The flat will be flown from the Sports Ground flagpole at every home fixture this season. And next....? On Saturday last the summer meeting of the Westward Ho! Ladies’ Golf Club came off on the Northam Burrows. The interest aroused by this game of skill is still on the increase, as was evident from the goodly number of ladies who came forward to compete for the prizes. Nine couples started, each couple attended by a gentleman associate member as scorer, while the friends of the players and other visitors looked on and enjoyed the gay scenes. 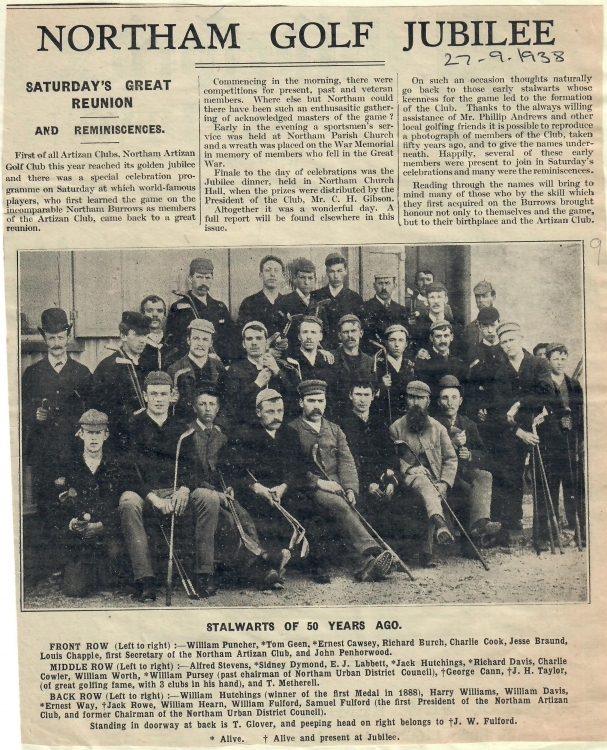 A course of three and three quarter miles, complete with a fence, a four foot stone wall and a two foot wall with a ditch, lay in store for the seniors of the newly formed Appledore Boys’ Sports Club when they set out on a cross-country run which took them over Northam Burrows on Saturday. Mr G Gosset gets the Moncrieff Cross. The annual autumnal meeting of the members of the Royal North Devon and West of England Golf Club were held on Thursday and Friday last, when a competition took place on the Burrows – on the former day for Sir Hope Grant’s Gold Medal, and on the latter for the Silver Medal of the Club. The weather was not very propitious, nor was the attendance of distant golfers so great as on former occasions. Bideford schools swept the board when twenty-two teams from nine different schools in North Devon entered the North Devon netball rally, held at Edgehill College on Saturday. Winners of the senior section were the Stella Maris Convent school, Bideford. The intermediate section was played in two parts, the finalists being Stella Maris and Convent High school, Ilfracombe, and again the Stella Maris team won. Bideford County Secondary School were the winners in the junior section. Ten years old Patricia Johnson, of Westward Ho! described as an extremely promising players, get instruction from coach Bob Clarke during a session at Edgehill College. Local youngsters who show an aptitude for tennis – and who perhaps have hopes of one day making the Wimbledon scene – get an opportunity during term time of improving their early technique by attending a series of local coaching courses run by Mr Bob Clarke, of Appledore. Friendly rivalry was keen last week when Bideford and Torrington County Secondary Schools met in football and netball games. The soccer score of 7-0 to Bideford was flattering, the game being closer than the margin suggests. 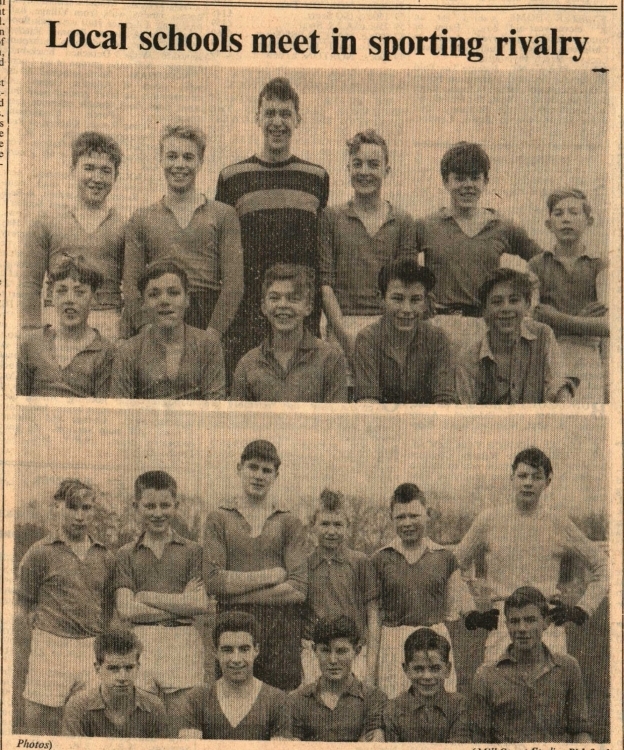 Bideford County Secondary School football team: Michael Eastman, Kenneth Hocking, Dennis Pengelly, David Hare, Paul Ashby-Crane, John Lockyer, Keith Sowden, Christopher Sowden, Brian Fishleigh, Kevin Naylor, Tony Beer. Torrington – Christopher Jeffery, Rodney Nancekevell, Jeffery Rookes, Christopher Copp, Melvin Lee, Desmond Nancekevell, John Bryant, Lesley Hutchings, Arthur Jones, Gordon Glover, Melvin Wheeler. Winners of the Bideford and District Skittles League President’s Cup are the Penpushers, a Bideford side, who beat Westleigh at the Swan Inn, Bideford, last week. The team is: Charlie Mountjoy, Clarrie Metherell, Trevor Beer, John Cleverdon, Ken Brend, Bob Whitefield. Westleigh put up a strong fight. 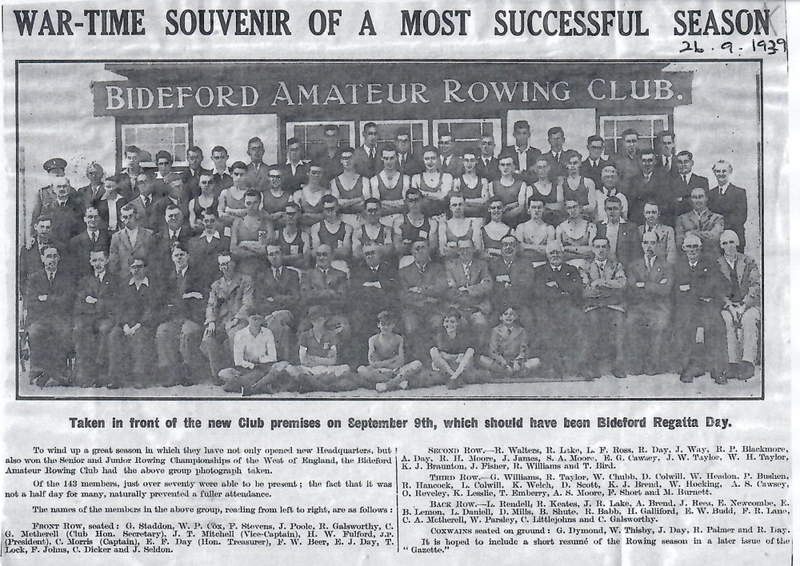 Their team was: Cyril Shaxton, Bert Gibbons, Henry Martin, Leonard Poole, Clifford Gillard, Alan Dart. Appledore British Legion ‘A’ go forward to the final of the Starkey Cup. Their team was: William Headon, Charlie Daniel, John Bailey, Jack Fowler, Bobby Bailey, Dave Hocking.